Pictured: Mau Mau fighters on parade after Kenya attained political independence. WE did not care about the artificial colonial borders between African countries. What we wanted was to liberate the African continent from colonial oppression, said Gotfrey Nangonya, a Pan-Africanist who, although himself an Angolan national, inspired many Namibians to join the liberation struggle he was himself involved in since the late 1950s. A resident of Ondjiva in the Cunene province of Angola, the 88-years-old Nangonya is currently in Windhoek for medical reasons. Speaking in an interview with Informanté at a time when Kenyan President Uhuru Kenyatta is on official visit in Namibia, Nangonya said that he has fond memories of Kenya where he briefly joined the Mau Mau uprising. 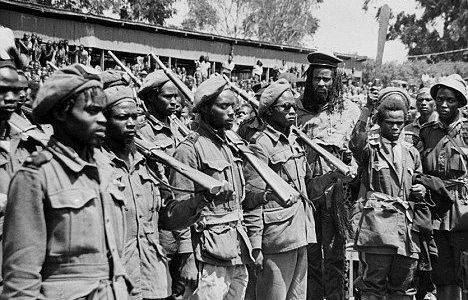 The Mau Mau were Kenyan freedom fighters who waged a war against British colonial rule from 1952 to 1960. Right at the start of the telephonic interview Nangonya freely made an important admission. “My son, due to the fog of age and ill health I can no longer put events in their chronological order nor remember all the dates,” he said. He said he joined the ANC in South Africa and was one of those sent by ANC leader Albert Luthuli to attend a conference in Egypt. On his way back to South Africa he and a companion ended up in Mombassa, Kenya, where they briefly joined the Mau Mau uprising. “We completed a few months of military training, but a senior Mau Mau leader who officiated at our passing out parade noticed our ‘unfamiliar’ names and, upon hearing that we were from South Africa, advised us to return to South Africa and continue the struggle there. However, we did not really care about the artificial colonial borders between African countries. 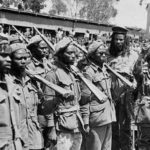 What we wanted was to liberate the African continent from colonial oppression and we were ready to fight anywhere in Africa,” said Nangonya. He said he returned to South Africa but did not stay long and eventually ended up in southern Angola and northern Namibia where he was classified as an ‘agitator’ and was constantly harassed by the police. “Nangonya inspired many of us to join the liberation struggle,” said retired Namibian police Commissioner Nghiyalasha Haulyondjaba. In 1974, Nangonya became the liaison officer between Swapo and UNITA in southern Angola and was caught in the cross fire when relations between the two moments turned sour in 1976. That same year he was detained by the MPLA-led government and kept in jail without trial. He was released in 1981 and immediately joined the Angolan Civic Association as head of its human rights program. His second detention was to come in November 1992 after the outbreak of fighting between government forces and UNITA following Angola’s first democratic elections, the results of which were rejected by UNITA. This second arrest was an apparent vengeance following a statement made by the then UNITA leader Jonas Savimbi during a campaign rally in which he allegedly identified Nangonya as the man who during the civil war was heading UNITA’s clandestine network in Luanda. Meanwhile, the Angolan government has recognized Nangonya as a war veteran.